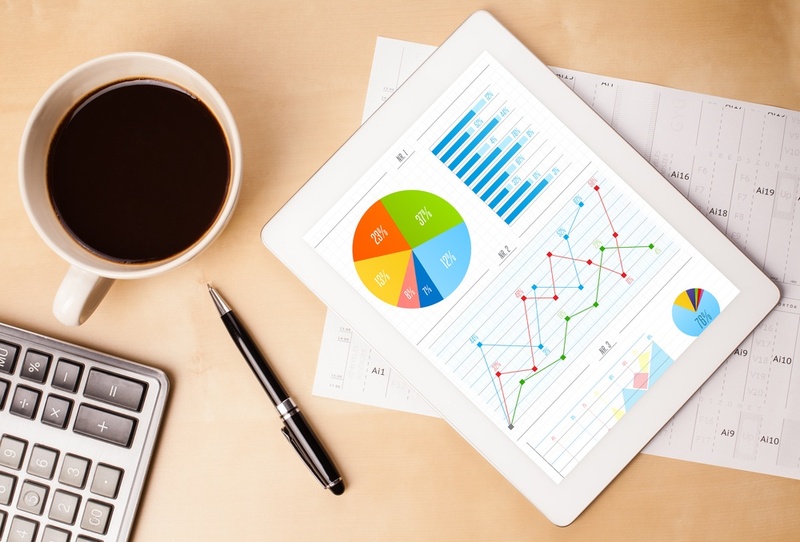 Webinar Myths: Are Live Webinars More Engaging Than On Demand? When you’re scouring the wealth of blogs that are out there, offering advice on online events and webinars, it’s clear that everyone seems to have an opinion. Sometimes, though, you need some solid data to back up these opinions. From January 1st 2013, right up until December 31st 2016 (1,460 days to be very precise), we started to look closer at the webinars we’d helped run in the past. We obtained 1.2 million rows of session data, which was then converted into charts graphs and plots. Using this wealth of data, we’re offering you (and ourselves!) 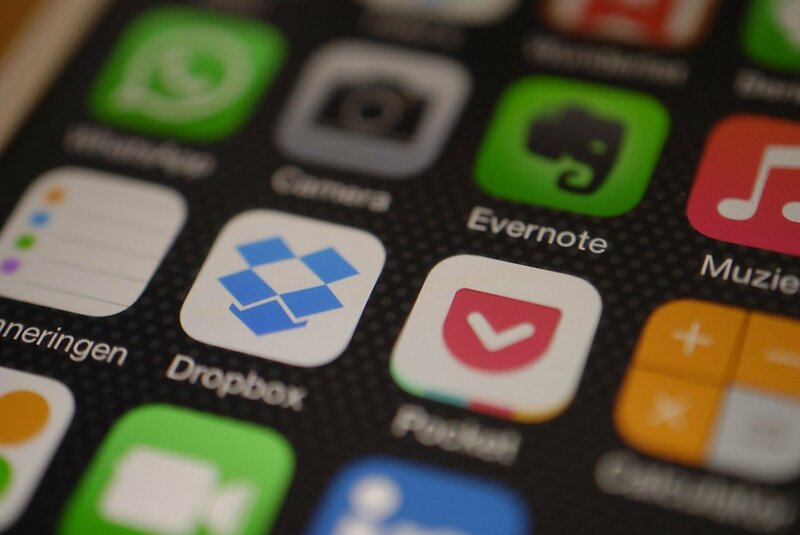 an in-depth look at the bigger picture of the world of online events and webinars. We’ll investigate a range of different issues, questions and problems, hopefully solving many of them along the way! A good way to measure how engaged people are during a webinar, is to measure when viewers start to drop off (literally sometimes). Viewing statistics look impressive when you list how many people attended a webinar. However what’s more impressive, is how long they attended for. The below density graph shows the relative likelihood for time that attendees viewed an online event, comparing both live and on demand attendees. 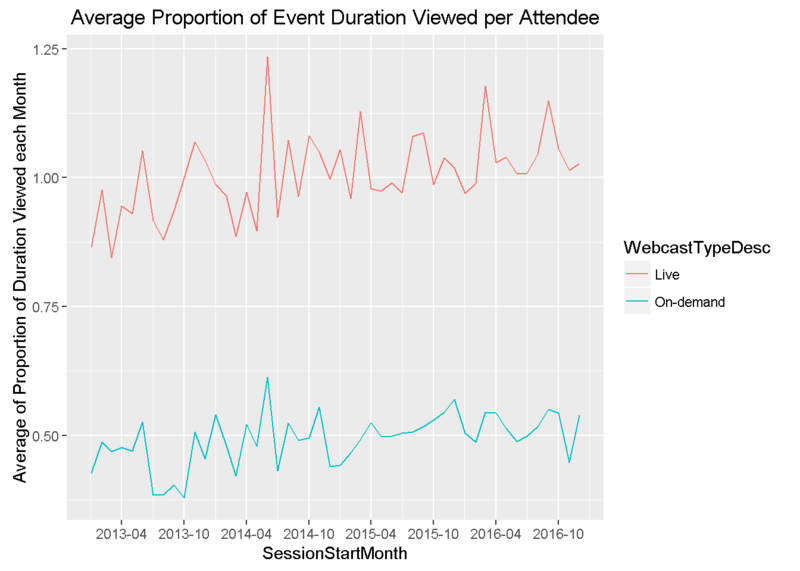 This graph demonstrates that viewers of on demand webinars were much more likely to watch less than ten minutes of a webinar, when compared to live attendees. Why this appears to be could be attributed to the fact that there are simply more who choose to watch events at their leisure, via on demand. Conversely, live viewers appear to be lesser in numbers, therefore their proportion will be low. However, this likelihood switches around at about the thirty minute mark. Live attendees were found to be more likely to watch half an hour or more, when compared to on demand viewers. 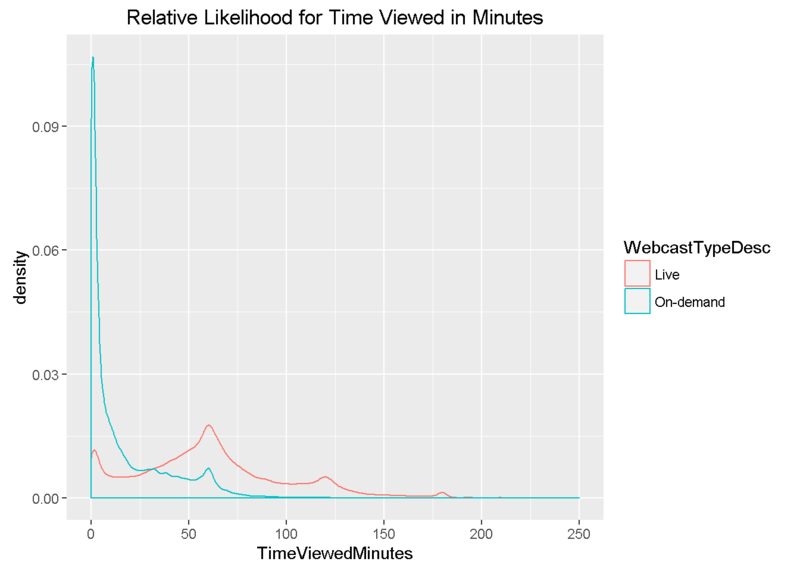 The relative likelihood of Live viewers engaging for longer, is directly related to, them attending the event and continuing to watch it for its entire duration. Because those in attendance have made a commitment to attend at a certain time, they are likelier to follow through with viewing the entire event, unlike on demand viewers, who can view at any time. As they’re attending for longer, the likelihood they’ll be engaged more with the webinar is greatly increased. So, we’ve established that on demand does have limitations when it comes to keeping viewers engaged. But, of the monthly attendees over that four year period, what was the average proportion of an event that they were actually viewing? Again, we’ll refer to another graph! At this point, we’ll note that the Webinar Duration figure is accurate for on demand events, however the live event figure isn’t updated after the event to reflect the actual running time. So here, we’ll concentrate on the on demand plot. As you can see, on average, on demand viewers were watching around 0.5 (half) of the events they chose to initially watch. If they’re only viewing half of your content, then they’re clearly less engaged with what they’re seeing. But, the point could again be made, is it only natural to do this when they’re not tied-in to watching the event at a certain time? 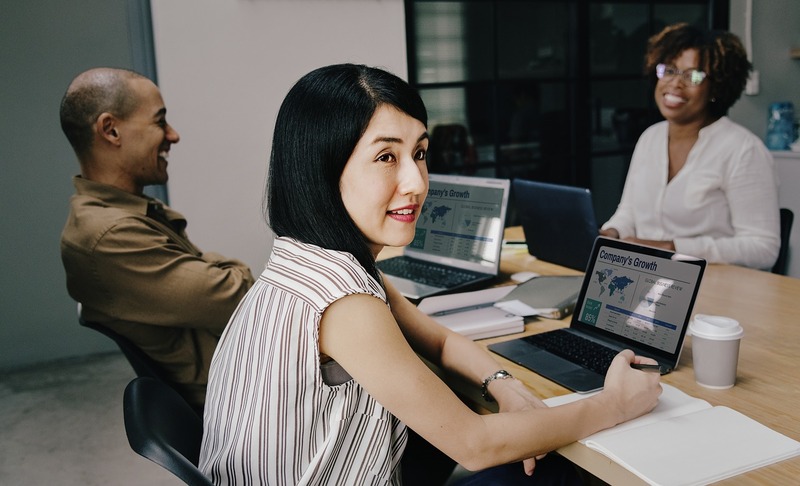 As they can pop in and out of a webinar at any time, they perhaps aren’t concentrating for long enough to be engaged with what’s being presented. 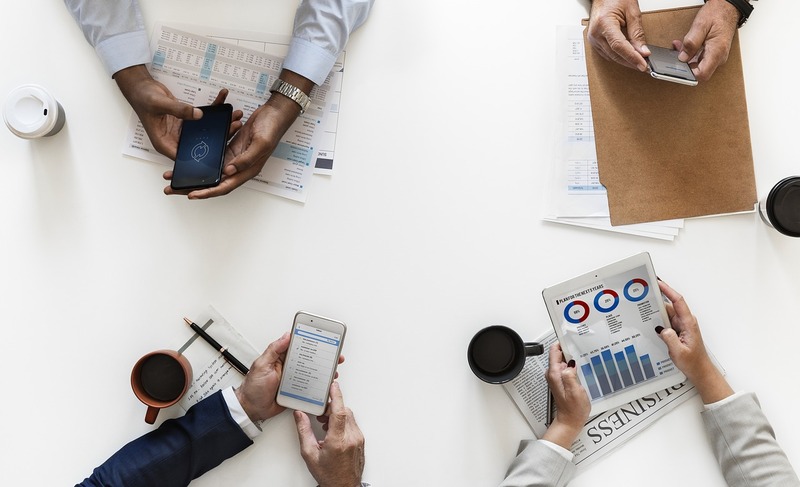 While on demand webinars definitely have their merits and uses, we can’t stress that enough, the limitations when connecting and engaging directly with viewers are certainly evident. Having a captive audience, who have actively registered to take part, on the day, works wonders for attendee engagement. Rather than simply listening to a pre-recording of someone talking to them, live events offer the opportunity for viewers to become involved in proceedings, therefore, they’re likely to view for longer, listening to more of what you have to say. On demand, however, is a great way to extend the shelf-life of your content, and serves a purpose of an information reference point and a good example of why people should attend your future events. Conclusion? - Live events are more effective in engaging audience members than on demand, which is more effective as an informative tool to drive future events. Next time, we'll be discussing exactly what the optimum length of a webinar is, and suggesting some different concepts to the usual online event approaches!